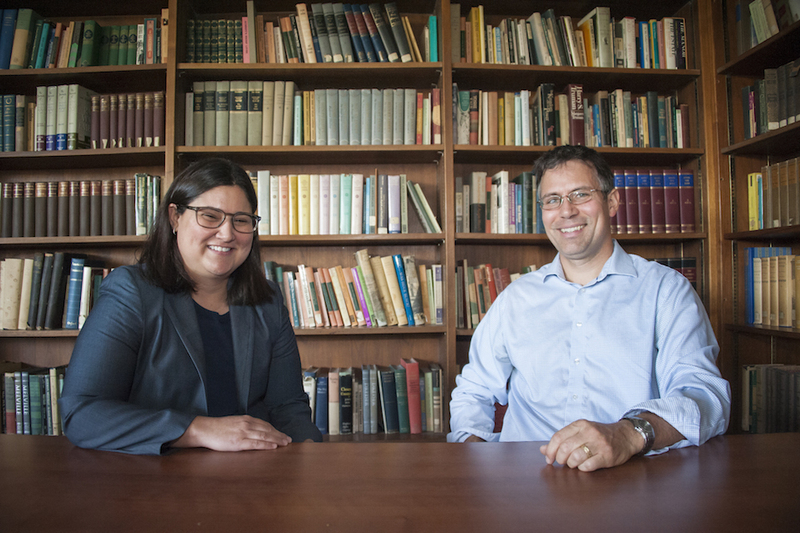 Chicana/o Studies professor Melisa Galván (left) and linguistics professor David Medeiros (right) will serve as mentors for the HSI Pathways to the Professoriate program. Photo by Luis Garcia. For those who dream of one day becoming a university professor, the journey from the student’s desk to the professor’s podium is more than just a short walk. It is a years-long process that involves difficult graduate coursework, papers submitted to academic journals and a knack for professional networking that can be nerve-wracking for many students new to the culture of academia. 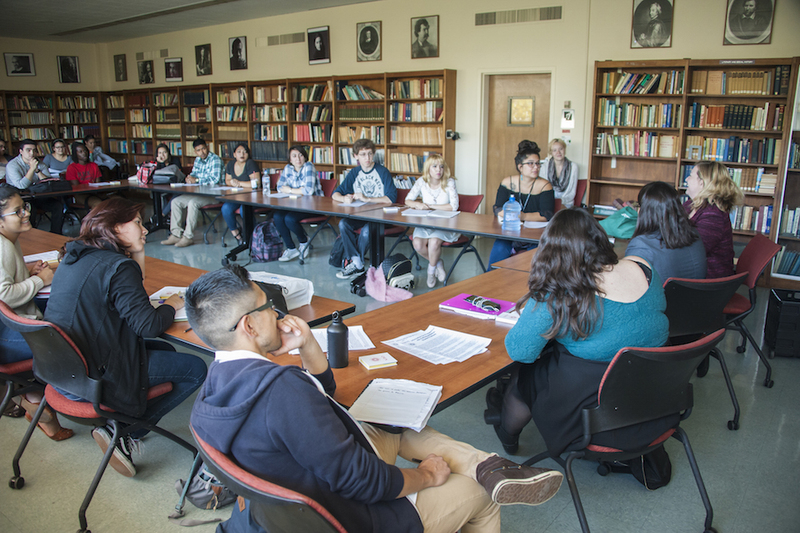 A new program at California State University, Northridge called HSI Pathways to the Professoriate might help make that journey to the academy much easier to navigate for students in the humanities and related fields. The Pathways program, which teams CSUN — a Hispanic serving institution (HSI) — with the University of Pennsylvania Graduate School of Education’s Center for Minority Serving Institutions, is supported by a $5.1-million grant from the Andrew W. Mellon Foundation. It aims to transform the landscape of the professoriate by increasing the presence and visibility of Latina and Latino faculty members. The program will serve 30 students over the next five years. Ten qualifying juniors will be selected this fall for the first cohort of HSI Pathways/Mellon Student Fellows. It will prepare the students in humanities and related fields, by providing the skills and guidance crucial to success from the admissions process through the end of their Ph.D. programs. Over 18 months, each student will be required to conduct an individual research project and attend a fully-funded six-week summer residential course on campus in 2017. Students will receive financial support for GRE preparation, application fees, trips to academic conferences — including an opportunity to present a research project at the University of Pennsylvania — and potential funding to begin doctoral research the summer after graduation from CSUN. Students who are accepted at one of the program’s five participating graduate schools — UC Berkeley, UC Davis, New York University, Northwestern University and the University of Pennsylvania — will receive assistance with their transition and a faculty mentor to meet them on the campus. Funding for their Ph.D. programs will be available at the five participating schools. Dozens of students attended an information session for the HSI Pathways to the Professoriate program. Photo by Luis Garcia. A key part of Pathways provides each student with one-on-one mentoring from a CSUN faculty member, throughout the 18-month undergraduate program. The faculty mentors are recent graduates of Ph.D. programs who can share their insight into the current challenges of obtaining a doctoral degree and entering the professoriate. CSUN professor of Chicana/o Studies Melisa Galván, who will serve as a Pathways faculty mentor, said the program is a wonderful and rare opportunity for students to get support throughout almost every step of the Ph.D. process. She said she would have taken advantage of an opportunity like this when she was a student. Linguistics professor David Medeiros, also a Pathways faculty mentor, said the students will gain academic know-how, as well as knowledge about the culture of academia. Medeiros said he was familiar with that culture because his father and his brother earned doctoral degrees, and that exposure proved crucial to his success — he knew to focus on research as much as coursework, and not be discouraged when facing rejections along the path. Galván pointed out that since the university is an HSI and many of CSUN’s students are from low-income or historically underrepresented backgrounds, supporting their career paths to become humanities professors will only strengthen the professoriate. The application deadline for the HSI Pathways to the Professoriate program is at 4 p.m. on Nov. 15. The next information session will take place from 12:30 to 1:30 p.m. on Oct. 12 in Jerome Richfield Hall 319. For other deadlines and more information, visit http://www.csun.edu/humanities/pathways-professoriate.